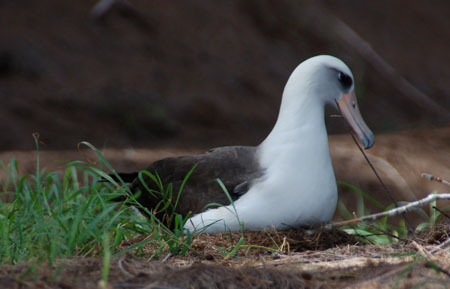 December 2008 was a good month for mushroaming Hawai'i. When we got to Kauai on Dec. 12, it had already rained every day for two weeks in Kapa'a. 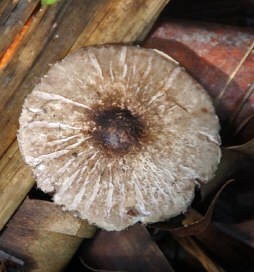 The rain did not stop and the sun shone once in awhile too, so fungi fruited plentiful, at least for Hawaiian condition. Hawai'i has a rather sparse funga (formerly mushroom flora) in the first place; as Don Hemmes & Dennis Desjardin stated in their very useful guide "Mushrooms of Hawai'i (2002) "what Hawai'i lacks in diversity and abundance, it makes up for in beauty and uniqueness". 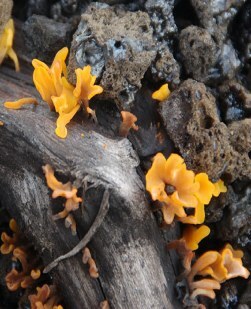 In this context it should be mentioned that so far no endemic ectomycorrhizal species is known, the few EM species growing in Hawai'i were all introduced with non-native tree species. 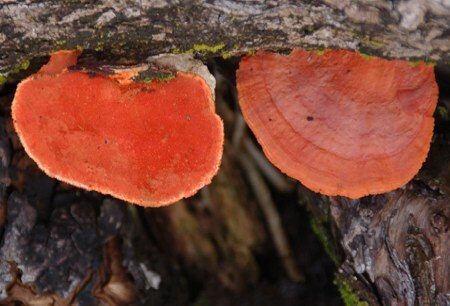 Thus saprophytic species rule, making up 95% of the 300+ species recorded so far (Hemmes & Desjardin 2002). UPDATE: I heard recent research has turned up an endemic ectomycorrhizal species, but I have not seen the publication yet. I would appreciate receiving a hint regarding the reference. As you can see from the below images, there is more to see in Hawaii than the beaches, resorts and Viking yachts for sale in port. Inland you can see some amazing and unique funga (= mycoflora) across the island. Of course there is nothing wrong with chartering a yacht and exploring the beautiful Pacific Ocean while visiting Hawaii. 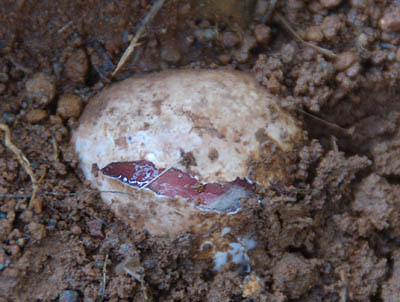 One of the two eggs is fullydilated. The fruiting body extends within hours by pressurizing already developed cells with liquid. 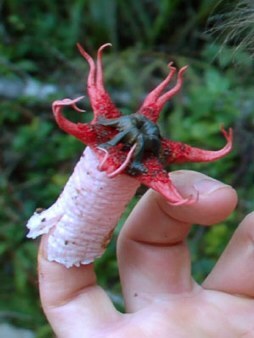 One of Hawaii's most beautiful and intriguing mushrooms is definitelyAseröe rubra, the "Starfish Stinkhorn" or "Sea Anemone Fungus". 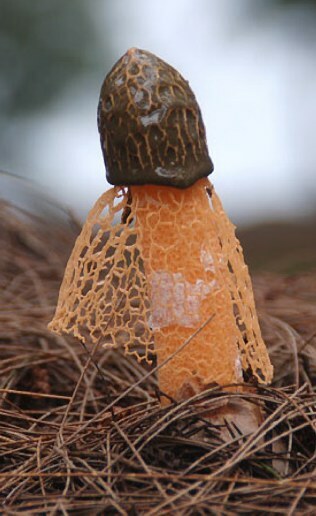 Starfish Stinkhorn indicates that it is unmistakably a member of the Stinkhorn / Phallales order named for the infamous Stinkhorn, poignantly known as Phallus impudicus. All Aseröe rubra photos were taken at Kalalau Lookout, Koke'e State Park, Mount Wai'ale'ale, Kauai Island, Hawaii on Dec. 19, 2007, 1200 m asl (4000 ft). This site is within 10km to the earth's most rainy site, Mount Wai'ale'ale (a.k.a. Waialeale, height 1569 m / 5,148 ft). Here, on this heavily eroded dormant volcano precipitation measures 11,700 mm (460 inches) onannual average. Photos: Daniel Winkler. And it does not reek so strongly of rotting meat like many of its lovely relatives, but offers a decisive spermatic note to spice up its aroma. Laid out on a lava rock the jelly-filled volva with its rhizoids is separated from the hollow stem of the fruiting body of Dictyophora multicolor. 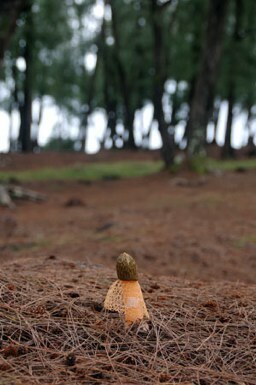 The Yellow-veiled stinkhorn Phallus multicolor aka Dictyophora multicolor growing out of needle duff of Iron wood (Casuarina equisetifolia). 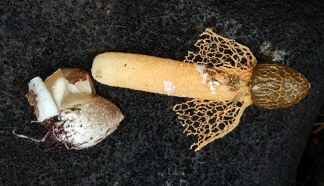 Most netted stinkhorns have white indusia, while Dictyophora multicolor has a yellowish indusium (the apron / veil-like structure). 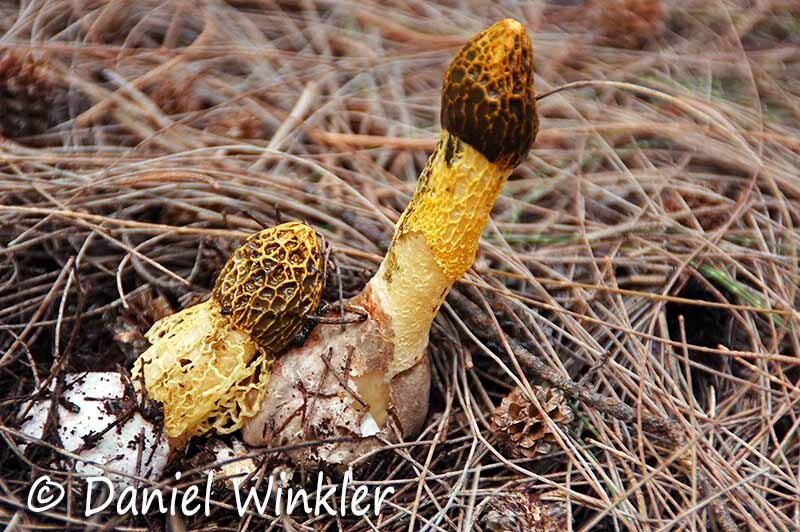 Also growing in Hawai'i is the Yellow-netted stinkhorn (Ph. 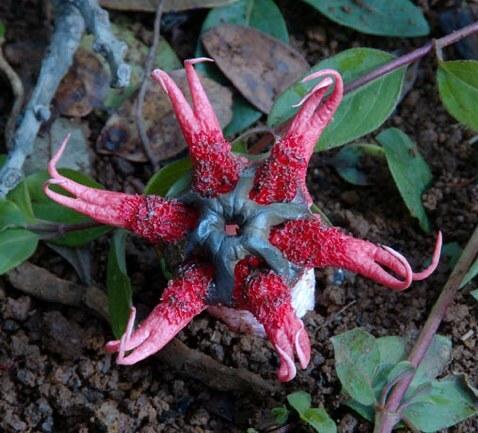 cinnabarinus), which has a longer veil and a cinnabar red receptacle, the tissue that is covered by the gleba. 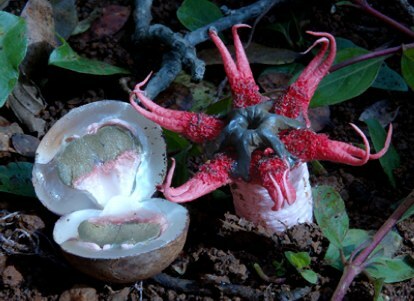 Two specimens whose gleba has been been partially eaten or ran off so that the color of the receptacles shows. These specimens were found in the same location but note the difference in the color of the stem and veil to the speimens above. The short veils still indicate Ph. multicolor. 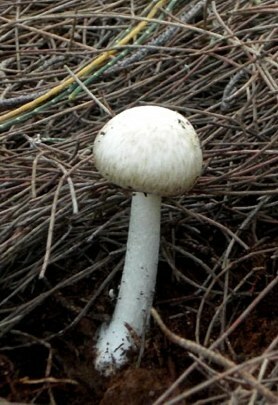 Amanita mormorata growing through the Casuarina needles. 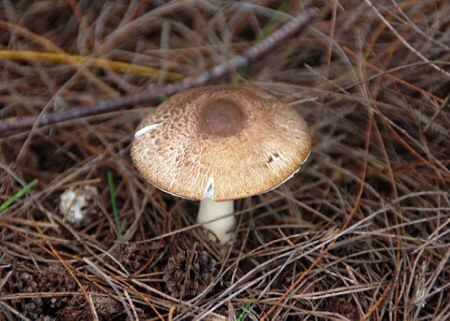 The species name of this Amanita refers to the marbled pattern of the cap. 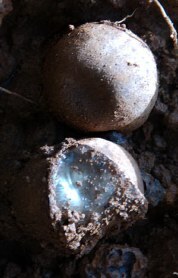 It is rather small with an cap diameter of 5 to 7.5 cm (2-3 in). Amanita mormorata surrounded by the needles of Iron wood (= Australian pine,Casuarina equisetifolia) and an old tree snail shell (Achatinella sp. ). 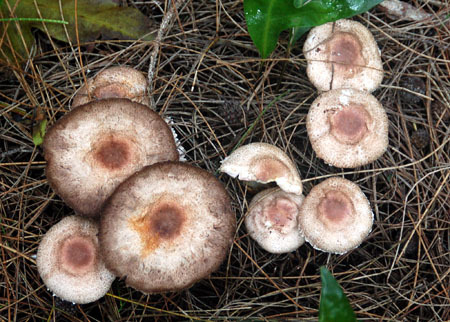 Iron wood and Hawaiian death cap live in ectomycorrhizal symbioses. 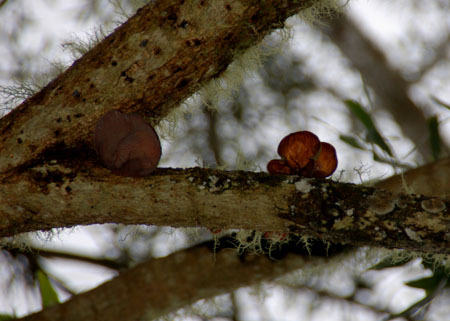 It is believed that this deadly poisonous mushroom was introduced from Australia while introducing one of its host trees such as Casuarina, Araucaria, Melaleuca or anEucalyptus species. © Daniel Winkler. 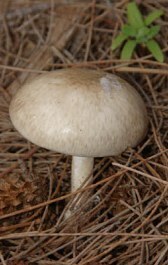 A more complete description of Amanita mormorata subsp. 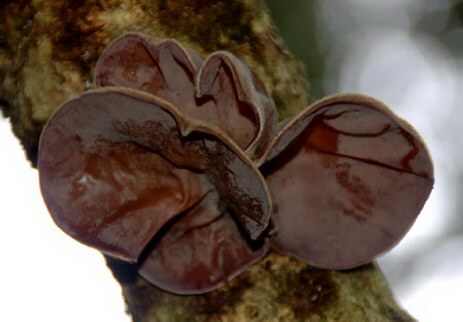 myrtacearum can be found on Tom Volk's webpage, where it was recently honored "mushroom of the month". 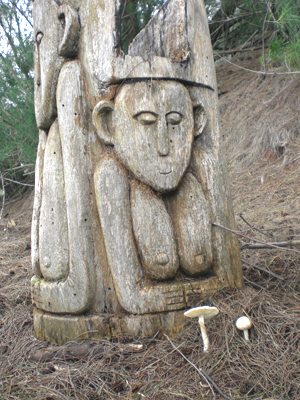 Carved spirits are watching over two marbled death caps on a beautiful site overlooking the Pacific ocean. All Amanita photos were taken near Moloa'a Beach, Kauai Island, Hawaii on Dec. 17, 2007, 50 m asl (160 ft), All photos: Daniel Winkler. A flush of Chlorophyllum molybdites fruiting along a road near Kapa'a, Kauai, Dec. 19, 2007. 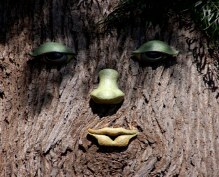 Photos: Daniel Winkler. Kapaa, Kauai, Hawaii, Dec. 19, 2007. Photo: Daniel Winkler. Chlorophyllum molybdites, a Green-spored shaggy parasol - note the pale greenish hue of the oldish gills - is a poisonous look-alike of several tasty shaggy parasols. 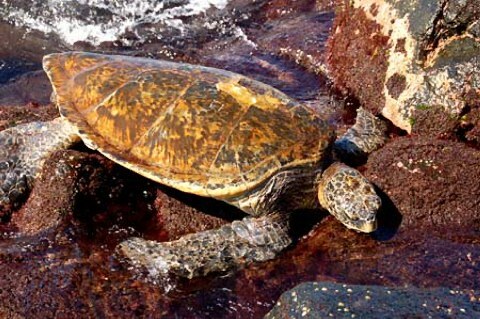 According to Hemmes & Desjardin it is causing the most fungally induced emergency room visits in Hawai'i. 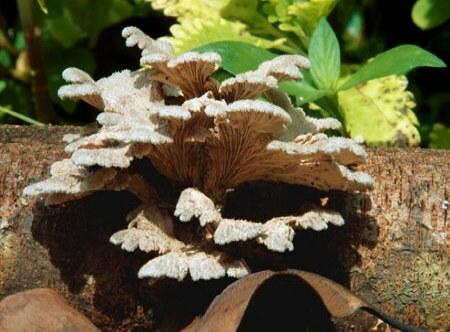 However, its unique green spores, which gave the genus its name, make it clearly distinguishable from other white-spored Chlorophyllum species, such asCh. rachodes, Ch. brunneum [back to PNW edibles] and Ch. olivieri. 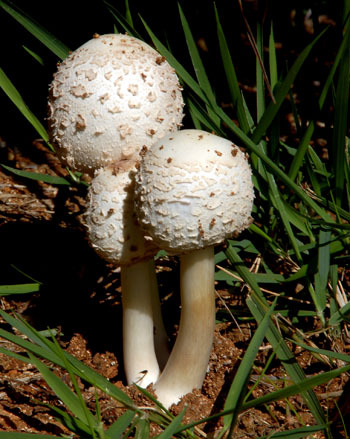 In the past these three were all identified as Macrolepiota. 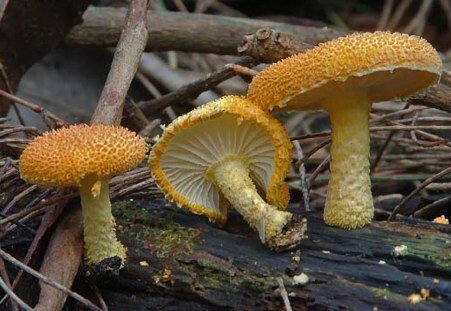 However, DNA analyses has shown (Vellinga 2002/2003) that these fungi are more closely related Ch. molybdites than to Macrolepiota procera, the Parasol mushroom, one of Europe's most famous edible mushroom. Sources: Vellinga, E.C. 2002. New combinations in Chlorophyllum. 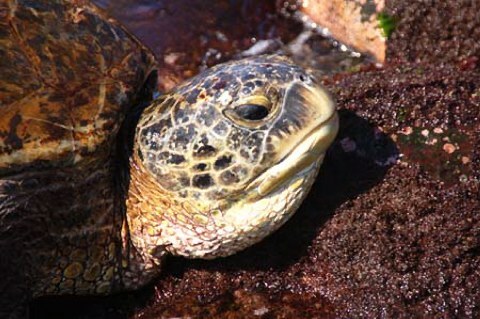 Mycotaxon 83: 415-417. Vellinga, E.C. 2003. 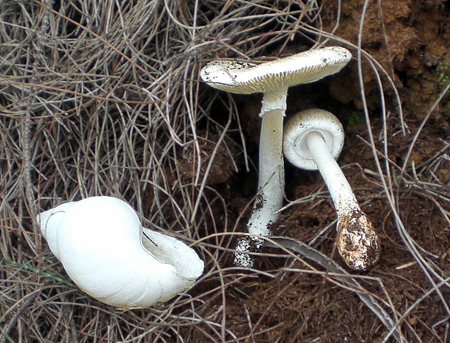 Type studies in Agaricaceae– the complex of Chlorophyllum rachodes. 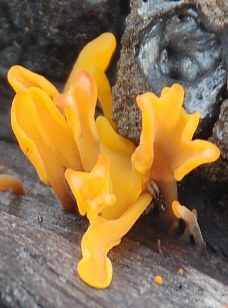 Mycotaxon85: 259-270. 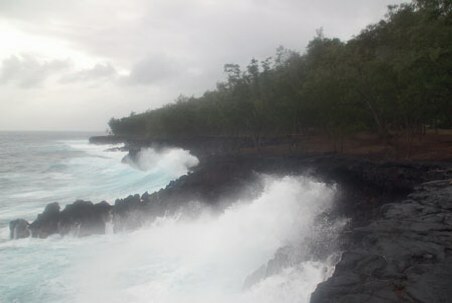 Typical conditions in December 2007 in Hawaii, the skies are gray and the Pacific surf is up. Picking Almond mushrooms under these conditions is ideal. The salt sprayed made this tasty mushroom even more delicious, yummy! (I like to eat this almond mushroom and the prince raw). 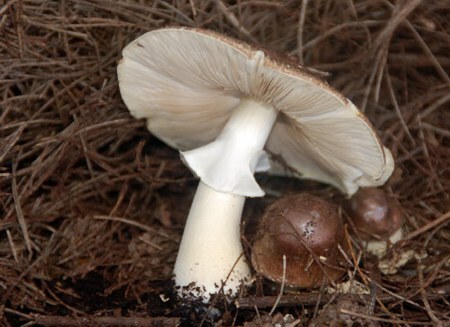 Agaricus subrufescens is not just tasty, but reputed to be highly medicinal. 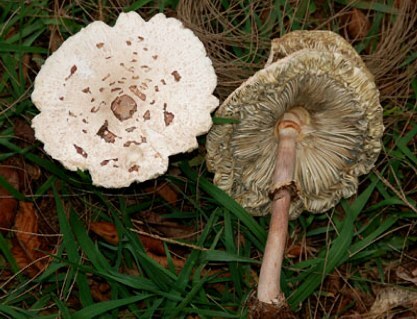 However, the almond mushroom made it to its myco-medicinal stardom under the name Agaricus blazei Murrill (sensu Heinemann) and most recently as A. brasiliensis Wasser et al. Lepista tarda Peck, a close relative of the Blewit [Lepista / Clitocybe nuda], is reputed to be as tasty as the Blewit, but it lacks the blewit's typical orange juice concentrate smell. Since I rely on my nose for the final identification of the blewit, I did not fry these ones. 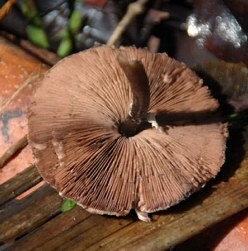 This mushroom has also been described as Clitocybe tarda Peck, Clitocybe sordida (Fr. : Fr.) Singer and Tricholoma sordidum (Fr.) Kummer. Desjardin, D.E. ; Hemmes, D.E. 2002. 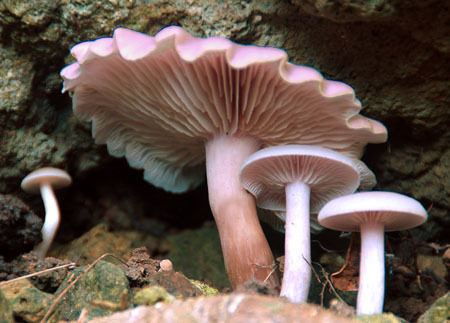 Mushrooms of Hawaii: An Identification Guide, Ten Speed Press, 1-212. Arora, D. 1986. Mushrooms Demystified. Ten Speed Press, Berkeley, CA. 959p.